Mountaintop removal and birth defects: What is Rep. Nick J. Rahall going to do about this? July 20, 2011 by Ken Ward Jr.
Well, I had a bite of sandwich in my mouth when he called, and our discussion was interrupted once so he could go and vote, but I finally got the chance to interview Rep. Nick J. Rahall yesterday about the troubling new study that found his constituents who live near mountaintop removal coal mining operations face greater risks of birth defects. We published a print story based on that roughly 25-minute interview this morning, but I wanted to provide some additional information about it here on Coal Tattoo. That’s disgusting, and whoever said that needs to apologize to the people of West Virginia. That’s just uncalled for. But from what he told me, Rep. Rahall hasn’t bothered to call or write the folks at Crowell & Moring who made that suggestion. And his outrage appears to come only after some local officials in his district started complaining about what the coal industry’s lawyers were saying. The bigger questions, though, are about what this study found — and what, if anything — anybody in government is going to do about it. I’ve met with constituents on this particular study as late as last Wednesday or Thursday, as late as last week in my office here in Washington. We discussed this particular report. And certainly, any information that is proven that shows a high incidence of illness or birth defects is of serious concern. And it ought to be given serious study. But how much time has Rep. Rahall put into reading the study and understanding its implications? The study does call for additional investigation, and I do agree that that is a wise course, and none of these issues should be taken lightly. They are serious concerns and as any cursory examination of my record will show, as all of us in public life and all of us period our priority is providing a better future for our children in West Virginia, their health, their safety, their education, their overall well being is our top priority. OK … but what is he doing about the problem outlined in the study? As the study says, additional investigation is necessary, and if these threats are proven, we need to be informed, we need to do whatever we can to reduce these threats. We ought to know more. We ought to be open to exploring solutions. Fine … so what exactly is Rep. Rahall doing to try to encourage or even require such additional studies and investigations? Remember — most of the mountaintop removal is occurring in his district, his home, the Southern West Virginia coalfields he’s represented in Washington since 1977. Has he contacted any agencies or requested a review by anyone of the findings? I have not yet, because I’m ascertaining as to which are those relevant agencies, and which could do the best job. Exactly how are you trying to ascertain that? Just getting professional opinions, which we’re in the very exploratory stages of doing now, as to who can be the … who knows the issues, who has the background. That’s something I can’t say off the top of my head. Now, this is where things get tough for Rep. Rahall, and where what he’s saying starts to make even less sense. At least one federal government agency has expressed concern over the birth defects studies and the other recent science suggesting adverse health effects from living near mountaintop removal operations). But, it’s that same agency that Rep. Rahall is doing his best to strip of its important authority to oversee how state regulators implement the Clean Water Act — how those state officials set water quality standards, issue discharge permits and enforce those permits. How does the legislation that you have cosponsored trying to reduce the ability of the EPA to oversee state regulatory programs under the Clean Water Act advance the cause of reducing birth defects among your constituents if those birth defects are related to mining? I don’t think my legislation, calling for increased cooperation between the states and the EPA is going against birth defects and our children’s health and safety. I think it would advance such common goals, certainly the states are not going to do what is adverse to if they had the proper data and proper information in hand, which I have no doubt they would, to make decisions adverse to children’s health or birth defects, and by working closer with the EPA, and the EPA has said, as you know, that this is a concern, that perhaps the facts can be shared. Let’s be clear about one thing: Rep. Rahall’s legislation would stop EPA from blocking Corps of Engineers permits that it finds would damage the environment. It would stop EPA from overturning weak state water quality standards unless state regulators agree to such action. And, it would keep EPA from being able to take back the “delegated authority” for states to run water pollution regulatory programs if EPA finds states aren’t doing a good job. Well, first of all, I don’t find in these studies, certainly not the latest one that is, where they make any recommendation as to what we should do about mountaintop mining. If it’s in there, I was not briefed on it, and I have not seen the study. Existing regulations to protect air and water quality in mountain- top mining areas may be inadequate, and enforcement of those regulations has been lax, though recent efforts by the Environmental Protection Agency may be moving in the direction of stricter regulations. The findings documented in this study con- tribute to the growing evidence that mountaintop mining is done at substantial expense to the environment, to local economies and to human health. Clearly, current attempts to regulate MTM/VF practices are inadequate. Mining permits are being issued despite the preponderance of scientific evidence that impacts are pervasive and irreversible and that mitigation cannot compensate for losses. Considering environmental impacts of MTM/VF, in combination with evidence that the health of people living in surface-mining regions of the central Appalachians is compromised by mining activities, we conclude that MTM/VF permits should not be granted unless new methods can be subjected to rigorous peer review and shown to remedy these problems. Regulators should no longer ignore rigorous science. I’ve always maintained that the existing laws should be enforced, whether it is public health, environmental or most importantly, safety. And before we rush headlong into new regulations, we need to find out if the current ones are working, if they’re being enforced, and if not, why not. So that would be my position on any new regulations. Again, I’ve always said with SMCRA for example, the problem has been enforcing the intent of the law when it was written back in 1977. It’s been a good law on the books, but as you know, enforcement thereof or the attitude or morale of workers or inspectors at OSM has been an up and down cycle depending on what administration is in office. It’s been uneven enforcement. But how are Rep. Rahall’s efforts to take away EPA’s oversight authorities going to help this situation? In West Virginia, we have done a better job, we are doing a better job now than we were decades ago, certainly, and that we continue to find the new solutions that we continue to explore for ways in which we can restore and reclaim the environment and the land after … in a post-mining use era. With all due respect, I told Rep. Rahall, that’s not what I asked … how are your efforts to stop EPA’s current initiatives going to help here? My efforts are not to stop EPA. My efforts are to get EPA to work closer with the state. Cooperative federalism is the name of the bill that passed her last week with my co-sponsorship. Rather than continue to stall or not issue decisions … is kind of … confrontational attitude rather than a cooperative attitude. The scientists say those permits you want issued would do irreversible damage, I said … Do you think permits should be issued that would do irreversible damage to the environment or public health? EPA ought to be working with industry to find better solutions, not sitting in meetings and not answer industry’s questions or nodding their heads and going off and taking actions as if the meeting with industry never occurred. There ought to be more cooperation so that both sides know the rules of the game. Oh, no, I’ve not seen the permits as they go through the process. I have seen reclaimed mountaintop removal sites. I’ve seen sites … that have been put to good public use in West Virginia, where that land would not otherwise be available. I have seen the oldest reclaimed site in West Virginia. I believe it’s in Logan County, up close, in which I can’t even tell the reclaimed site from the untouched area next to it. Untrue. First … we need more investigation, as some of these studies have themselves have said is necessary. There is no perfect study … I understand the frustration. I’m not in their shoes, but people living next to these sites, the inability of them to be able to stop what’s occurring above their homes. But I think with new ownership now in Southern West Virginia, that we’ll see a reaching out by the companies to try to work with these residents ahead of time, hopefully, in the permitting process, or before the process even starts, to try to work out arrangements with them to ensure that they’re not placed in harm’s way. I pointed out that when he was chairman of the House Natural Resources Committee, Rep. Rahall held a lengthy and comprehensive hearing to mark the anniversary of the passage of the Surface Mining Act. Citizens and citizen advocates testified about the damage they see being done by mountaintop removal. Why hasn’t Rep. Rahall sought any legislative solutions to those problems? Well, I’m not sure that legislative action is as I’ve said a little while ago, is the answer to their concern for a better enforcement of current laws and regulations that are on the books. It would seem the latter would be our first avenue to ensure that these concerns are taken into account. But, I asked, what about his EPA legislation … isn’t it really a step in the other direction, a weakening of current law rather than a push to enforce what’s already on the books? That legislation is aimed at seeking a cooperative federalism, cooperation rather than confrontation, between the federal agencies and our state agencies. I would think that would force a discussion, a meeting, where the two agencies would work together. That’s my goal there. How is taking EPA out of the loop on water quality standards going to help residents of your district not be exposed to the sorts of things that might contribute to birth defects? The effort is not to take EPA out of the loop, but rather to keep the states from being taken out of the loop. So there you go … that’s what Southern West Virginia’s congressman has to say on this issue. Depressing to say the least, but thanks for pursuing the issues with Congressman Rahall. One more thing, if i may. As i said in an article in the July issue of the Highlands Voice (p7 of http://www.wvhighlands.org/Voice%20PDFs/VoiceJuly11.pdf) while Congressman Rahall has been there supporting WV in many other fights, he’s dead wrong on mountaintop removal … and has been for decades –even as then Secretary of the Interior Bruce Babbitt was honoring the Congressman for his support of the Surface Mine Act on the 15th (was it?) anniversary of SMCRA during a gathering of notables who were flown into and plopped down on the Hobet 21 mine site/complex for the event . The only way I can fathom Congressman Rahall’s rational on the science presented to him is to chalk it up to cognitive dissonance. Continued support of a bill to hamstring the EPA in light of the recent scientific studies showing links between MTR and adverse health effects on his own constituents makes no sense at all. Rahall made clear what kind of “cooperation” he’d like to see when he said that “EPA ought to be working with industry to find better solutions, not sitting in meetings and not answer industry’s questions or nodding their heads and going off and taking actions as if the meeting with industry never occurred.” What he really wants is for EPA to roll over for the coal companies like DEP is so willing to do. You know, in response to person who commented that they wished all the mountains would be leveled in Boone, Logan and Mingo counties so that industry would come in here, answer me this. There have been thousands of acres leveled already, plenty for industry to come here now. Where are they? We don’t have anything because of coal. Who in their right mind would want to come here in all this dirt and filth and invest or build anything? Our roads are beaten to death by the mammoth coal trucks, the air is nasty dirty, the water leaves a whole lot to be desired, so tell me, what industry would want to locate in a place that has be torn all to pieces? Our elected officials know this, they don’t care as long as their coal buddies are taken care of. 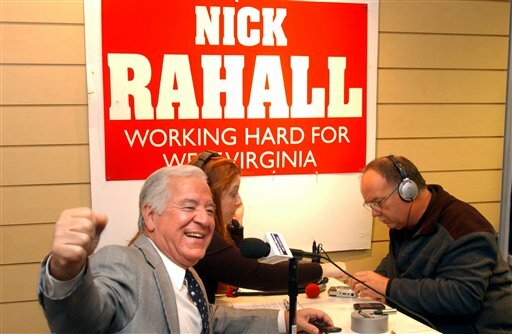 Rahall has turned a deaf ear to the truth for far too long. Is there a detailed list of the counties they studied or do we just extrapolate from the map? It seemed that many of the non-mining counties were outside of EKY and WV and in TN and VA. I admit not knowing these counties as well as do EKY (like the back of my hand) or WV (moderately) but I don’t think of those counties as being as impoverished. It would be helpful to better understand the culture of the non-mining communities. That being said, it seems hard to deny some elevated presence of defects in mining areas. For me, the real question is do folks understand these risks and accept them for the sake of the economy, or are they unaware. I’ve long felt folks in Appalachia realize mining is a hard life and willingly accept those risks.